After trickling out a couple at a time in the early part of the year, the floodgates open on movie releases this weekend, with four major releases firing at four separate markets. The chance of a huge breakout is small, but overall the box office should see a nice kick up from the last few anemic weeks. Any time there's an animated film in a market like this, it instantly becomes a favorite to take the weekend crown. 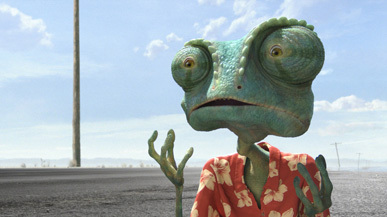 When it has one of the biggest box office draws out there, like Rango does, it's doubly sure to be one. Johnny Depp stars as the title lizard, who finds himself drafted into being the sheriff of a dusty western town of (literal) critters and varmints to protect against the tyranny of some outlaw snakes. Unless you count A Bug's Life adapting The Magnificent Seven by way of The Seven Samurai, it's the first animated western, and it seems like rich territory to mine for zany madcap action. In addition to Depp, there's a pretty solid cast of voice talent, including Isla Fisher, Abigail Breslin, Ned Beatty, Timothy Olyphant, Alfred Molina and Bill Nighy, which is a sufficiently weird group of people to make me think there could be something interesting in the film itself. Directed by Gore Verbinski, it seems to have a lot of energy and inspired lunacy, and an attractive, if off-beat look. Much has been made about the relatively unique way this film was made, which involved the actors actually performing as much of the film on sets as possible, with the animation being done based on these performances. From what I can tell, that energy seems to have made the transition to CGI wholly intact.